These days, most drivers are aware of the fuel efficiency of their cars. They have a general sense of the miles per gallon they get, and they know how that mileage impacts their wallets, especially when they pull up to the gas pump. But are you aware of your car’s carbon footprint, and how its carbon footprint can contribute to air pollution in your area and the environment as a whole? According to the EPA, a carbon footprint is a measure of “a vehicle’s impact on climate change in tons of carbon dioxide emitted annually.” In simpler language, it’s a measure of a car’s emissions. Automotive emissions have been a concern for decades, especially in regions like Southern California, where car emissions have contributed to extensive amounts of air pollution in cities like Los Angeles. Other cities with air-quality problems include Pittsburgh, Baltimore, Detroit, Houston, Sacramento, and Cleveland. In addition, carbon dioxide can affect the ozone in the atmosphere and contribute to global warming. So how can you determine your car’s carbon footprint? The EPA makes it simple by rating every car according to the tons of carbon it emits annually. Generally, a car’s carbon footprint relates directly to its fuel efficiency, with the burning of one gallon of gasoline contributing to 20 pounds of carbon dioxide emissions. That means fuel-efficient cars like the Toyota Prius, the Honda Civic Hybrid (above), the Toyota Camry Hybrid, and the Ford Escape Hybrid have low carbon footprints. According to the EPA, the Prius emits 4 tons of carbon dioxide a year, the Honda Civic Hybrid emits 4.4 tons, the Camry Hybrid emits 5.4 tons, and the Ford Escape Hybrid emits 6.6 tons annually. Similarly, compact and sub-compacts like the Toyota Yaris (5.7 tons), the MINI Cooper (5.7 tons), the Toyota Corolla (5.9 tons), and the Ford Focus (6.6 tons) also have relatively low carbon footprints. On the high end, the Lincoln Town Car emits 10.2 tons per year, the Audi S6 emits 11.4 tons, the Ford Explorer 4WD emits 12.2 tons, the Mercedes-Benz E63 AMG emits 13.1 tons, and the Bentley Arnage RL emits 16.6 tons annually. Obviously, the best way to reduce your car’s carbon footprint is to choose a more efficient car when you’re purchasing a new vehicle. However, no matter which car you drive, you can take certain measures to reduce your car’s carbon footprint. For instance, you can keep the tires properly inflated, change your air filter regularly, avoid sudden acceleration, keep the air conditioning turned off as much as possible, and keep the car at 55 miles per hour on the highway. Of course, you could also car pool to work, ride a bike, or take public transportation whenever possible. Finally, in a recent meeting with top automotive executives in an attempt to reduce car emissions, Governor Arnold Schwarzenegger identified a number of strategies that go “beyond the tailpipe,” according to the San Diego Times-Union. These strategies include synchronizing traffic signals so cars idle less, equipping more cars with GPS systems to they can avoid congested areas, and removing older, less efficient cars from the roads. All good ideas — and all valid goals as drivers, automakers, and governments work together to reduce carbon emissions. Looking for a way to reduce your monthly bill at the gas pump? You’re not alone. All across the country and beyond, drivers stung by rising fuel costs are looking for relief, and many are taking action by trading in larger vehicles like SUVs for smaller, more fuel-efficient cars. Sales of the Toyota Yaris (above), for instance, soared by 46 percent in April, when compared to the previous year, while sales of the Ford Focus jumped 32 percent in April, according to reports. It’s easy to see why – the Yaris with a manual shifter ekes out 36 miles per gallon on the highway, according to the EPA. Thanks to its 11-gallon fuel tank, you can fill it to the brim for 25 or 30 bucks or so, while drivers of big SUVs are shelling out $60 or $80 (or more) per fill-up. The Ford Focus manages a respectable 35 miles per gallon on the highway, comes with six airbags, and can be equipped with such high-end features as the Ford Sync voice-activated communication and entertainment system. These days, it’s a bargain in more ways than one (prices start at under $14,400), and it could represent the wave of the future. In fact, many automotive observers and experts believe we’ve reached a tipping point, which arrived when gas prices crossed the $3.50 per gallon mark. Sales of compact and subcompact cars accounted for about 20 percent of total auto sales in April, a first for the industry, according to The New York Times. And many believe the trend will continue, with sales of small cars continuing to grow steadily while sales of larger vehicles, such as big SUVs, continue to shrink. So what’s available in showrooms today for drivers who are looking for better fuel efficiency? Quite a lot, as it turns out, including some models you might not expect. The Pontiac G5, for instance, gets up to 35 miles per gallon on the highway, although Pontiac recommends premium fuel, which sort of negates any mileage benefits cost-wise (the car will run on regular gasoline but not at peak performance). The Chevy Cobalt with the 2.2-liter, four-cylinder engine and manual shifter manages 33 miles per gallon, while the MAZDA3 four-door sedan with the 2.0-liter double-overhead-cam engine (above) gets up to 32 miles per gallon while still delivering a respectable 148 horsepower. Of course, trendy cars like the Honda Civic Hybrid (45 miles per gallon on the highway), the MINI Cooper (up to 37 miles per gallon), the Scion xD (33 miles per gallon), and the venerable Toyota Corolla with the four-cylinder, 1.8-liter engine (35 miles per gallon) all represent good options for budget-crunching drivers. The fact that those cars are imports is not lost on Detroit, which finds itself scrambling as drivers migrate away from profitable SUVs to less-profitable compacts and subcompacts. What will this mean for American automakers, and how will they respond to this fundamental shift in buyers’ driving habits? Stay tuned – we’re about to find out. Ford received a small bit of good news recently – sales of its Focus compact car (pictured above) were up 24 percent for the month of March 2008. Honda saw sales of its Fit subcompact increase as well, by more than 73 percent. Sales of the Nissan Altima and Honda Civic also were up, by 14 percent and 10 percent, respectively. Those were among the few bright spots in auto sales over the past few months. Sales of trucks and SUVs tanked, as car buyers continued to migrate away from larger vehicles to smaller, more fuel-efficient sedans and coupes. It’s easy to understand why, with gas prices soaring into the stratosphere. And it naturally leaves some automakers (such as Honda and Toyota) in better positions than others. This shift in car-buying patterns has automakers scrambling to rejigger their fleets, and some are doing that more successfully than others. Ford, for instance, actually posted a profit for the first quarter of 2008 (due in part to the fact that the company has trimmed its workforce substantially and has plans to shut down some shifts at truck plants). And all automakers are eyeing smaller, more efficient cars. 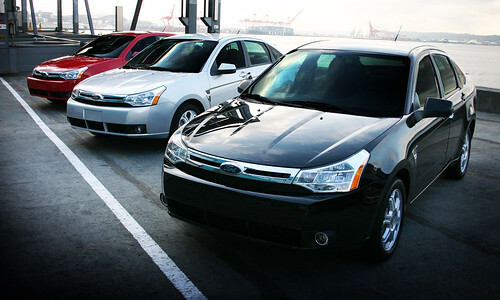 Ford, for instance, has plans to expand its fleet of small cars in 2009 with the addition of the new Fiesta, which Ford calls its first “global” small car. Recently unveiled at the Geneva Auto Show, the Fiesta will be powered by a range of fuel-efficient engines and bring “big car features to the small car segment,” according to Ford. That’s a trend we’ll be seeing more of in the years to come, as automakers add luxury-oriented features like innovative sound systems to their smaller cars in an effort to attract new buyers. For instance, Ford has added its new Sync feature to some Focus trims, and upcoming trims of the Chevy Cobalt are expected to come equipped with audio systems that include USB ports, so drivers can plug portable thumb drives into their car stereos, adding a new functionality that will make it easier for drivers to take their favorite songs with them wherever they go. Don’t expect automakers to completely abandon SUVs, but you can expect SUVs to become smaller and more efficient. Audi, for instance, just unveiled its new Q5 SUV at the Beijing Auto Show (although to us it looks more like a crossover vehicle or a hunky wagon than an SUV). Powered by a range of fuel-efficient engines and featuring permanent all-wheel-drive, the Q5 will measure about 15 feet long, 6 feet wide, and 5.4 feet high, giving it a smaller overall footprint than many other SUVs. Audi calls it “an SUV of all-new proportions,” and notes that it will be “sportier than any of its competitors.” Whether it will prove a hit with buyers seeking smaller, fuel-efficient vehicles remains to be seen, but it’s certainly a step in the right direction. GM calls it “responsibility without sacrifice,” and perhaps that’s the best way to describe the 2009 Cadillac Escalade Hybrid, which recently made an appearance at the Dallas Auto Show. The quest for fuel efficiency has reached all the way to the top of automakers’ lineups, and even vehicles with long-standing reputations as gas guzzlers are cleaning up their acts, as the new Escalade Hybrid demonstrates. GM goes so far to call the Escalade Hybrid the world’s first large luxury hybrid SUV. Like many hybrid vehicles, the Escalade Hybrid uses a two-mode hybrid system, which switches between an electric motor and a 332-horsepower, 6.0-liter V8 gas engine as the vehicle’s speed and power requirements vary. When the Escalade stops at a traffic light or slows in traffic, the gas engine shuts down and the SUV runs on the electric motor to conserve fuel. As the Escalade accelerates, it transitions to both the electric motor and gas engine, and under heavy acceleration or when full power is required, the SUV will run solely on the gas engine. This configuration results in a 45 percent improvement in fuel economy in the city, according to GM, although official mileage estimates from the EPA aren’t available yet. Regenerative braking, which captures energy whenever the brakes are applied, keeps the on-board battery charged. The Escalade also comes equipped with Active Fuel Management, the first for a Cadillac. The system will shut down four of the engine’s eight cylinders, even at highway speeds, if they’re not required, improving fuel economy even more. A full-color touch-screen Navigation Radio displays information about the hybrid system, and also displays the standard rear-view camera as well as controls for the Bose 5.1 surround-sound audio system and tri-zone automatic climate control. Nuance leather-covered seats and a power-assisted rear liftgate, which operates at the touch of a button, will be among the Escalade Hybrid’s other standard features. The exterior design will retain the Escalade’s distinctive grille and chrome accents. 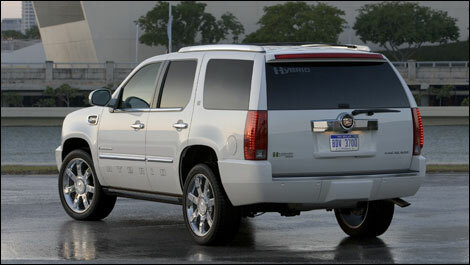 Both two-wheel and four-wheel-drive trims will be available when the Escalade Hybrid goes on sale this summer. Two New MINI Coopers Debut In U.S. Although they made their official world debut at the Geneva International Motor Show earlier in March, the MINI John Cooper Works Hardtop and MINI John Cooper Works Clubman took their U.S. bows on Thursday, March 20th at the New York International Auto Show. The two new performance-oriented trims, which will be available this summer, feature upgraded powerplants as well as suspensions, exhaust systems, manual transmissions, electrically power-assisted steering, and high-performance brakes developed by British-based John Cooper Works and inspired by the shop’s fifty-year racing history. In the 1940s, John Cooper, who was trained as a toolmaker, teamed up with his father Charles to create the Cooper 500 Formula 3 race car and form the Cooper Car Company. As a result of his success on the racing circuit, Cooper was tapped to create race-oriented versions of the British-made Mini, starting in the early 1960s. Mini Coopers, as they were dubbed back then, proved popular for decades. Today, the relationship continues, as John Cooper Works, now under the direction of John’s son Mike Cooper, has recently merged with MINI and will create high-performance versions of the popular sub-compact car. The two new MINIs just announced are the first to appear under this relationship. The John Cooper Works Hardtop and Clubman both pack a 208-horsepower, 1.6-liter, turbocharged four-cylinder engine under their hoods. The engine can drive the Hardtop from 0 to 60 in just 6.2 seconds, while the larger, cargo-oriented Clubman takes 6.5 seconds to reach 60 mph. Both trims top out at 147 mph. The engine in both trims links to a specially modified six-speed manual transmission, and both the John Cooper Works Hardtop and Clubman ride on a sport-tuned suspension and exclusive 17-inch light alloy rims with high-performance tires. In addition, both come equipped with a Dynamic Stability Control (DSC) system that incorporates Dynamic Traction Control, the first for a MINI. When the driver deactivates the DSC system, Electronic Differential Lock Control kicks in, providing enhanced stability and cornering ability during aggressive driving. This latter feature is exclusive to the John Cooper Works trims. Both trims will be created at the factory rather than at the dealer using kits. Of course, the enhancements will boost pricing for both trims by a few thousand dollars, when compared to the standard trims on which they’re based. What do the 2009 Nissan Murano, the 2008 Honda Civic GX, and the 2008 diesel-powered Volkswagen Touareg have in common? They’ve all been singled out for recognition in various automotive categories — some good, some not so good. First, the good news. The Insurance Institute for Highway Safety, a non-profit research institute based in Arlington, Va., has named the 2009 Nissan Murano (above) the Top Safety Pick for 2008. The Murano performed best in front, side, and rear crash tests out of a field of nine mid-sized, four-door SUVs tested. Redesigned for 2009, the Murano now includes electronic stability control as a standard feature, which helped it claim top honors in the competition. It also excelled in protecting passengers from whiplash injury in rear-end crashes, and in protecting the head, chest, and abdomen in side crashes. The Mazda CX-7 and CX-9 SUVs, as well as the Mitsubishi Endeavor, earned good ratings in the crash tests, while the Jeep Liberty, Jeep Wrangler, and Kia Sorrento came in at the bottom end of the scale. The American Council for an Energy-Efficient Economy, an independent, non-profit research group based in Washington, D.C., has assigned environmental scores to all 2008 cars and passenger trucks, and has named the natural gas-powered 2008 Honda Civic GX as the “greenest” car of the year. The innovative Civic GX, which has won this award for five consecutive years, has a 113-horsepower i-VTEC engine that runs on compressed natural gas (which can be refueled at home) and is a near-zero-emissions vehicle. 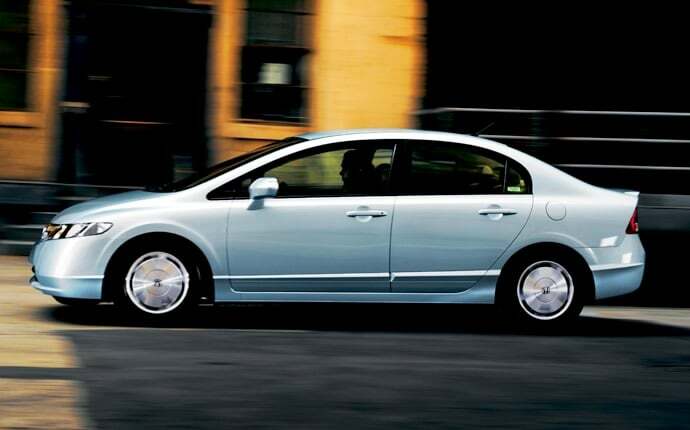 The Toyota Prius, Honda Civic Hybrid, Smart Fortwo Convertible, and Toyota Yaris joined the Civic GX in the top five greenest vehicles for 2008. At the opposite scale, the diesel-powered Volkswagen Touareg was named the “meanest” vehicle for 2008, meaning that it’s the most environment-unfriendly vehicle. Diesel-powered cars from Mercedes-Benz, as well as a number of the world’s top exotic supercars, such as the Bugatti Veyron and the Bentley Azure, also received poor environmental marks.